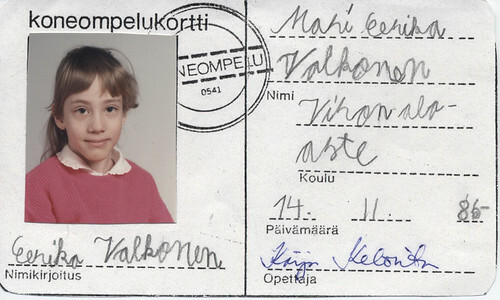 In primary school in textiles class we were all given these rather spiffy "Sewing machine driver's licenses" when we had learned how to operate a sewing machine properly. 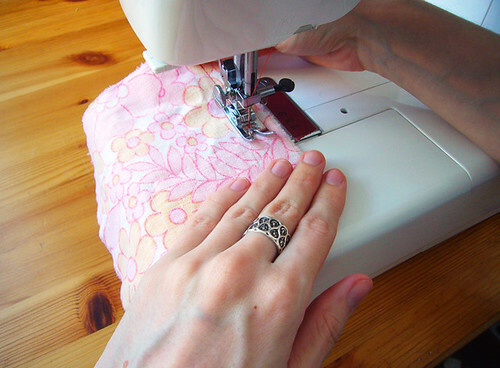 I had of course learned how to work a sewing machine a few years before this, as my grandmother taught me how to sew when I was about 6 or 7. I truly appreciate everyone who has taught me the ins and outs of sewing, from my gran and my primary school teachers to Mrs. Earnshaw who taught textiles when I was in secondary school (she along with my grandmother were the biggest influences in me choosing my career path) and all my teachers when I was in Savonlinna studying to become a costumier. All my teachers have added to my love of sewing by sharing their own passion for it, and I am grateful for everything they taught me. 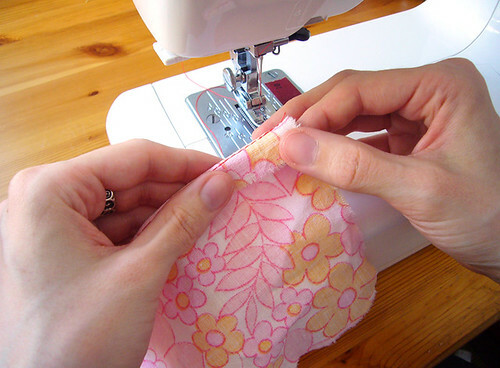 To share some of the vast amount of sewing knowledge that was given to me, here's a little tutorial on sewing perfect corners. I learned this while in Savonlinna, and this trick makes making tidy corners so much easier and quicker. First sew one side of whatever it is that you're making. I'm using a contrasting thread here to show the stitches better, but it's of course best to use thread that matches your fabric. 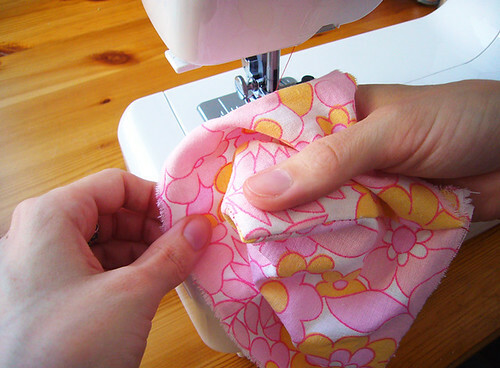 Fold the seam allowance forward along the stitch line and pin it down (or simply hold it down if you can't be bothered to fetch your pins from the other table like me). 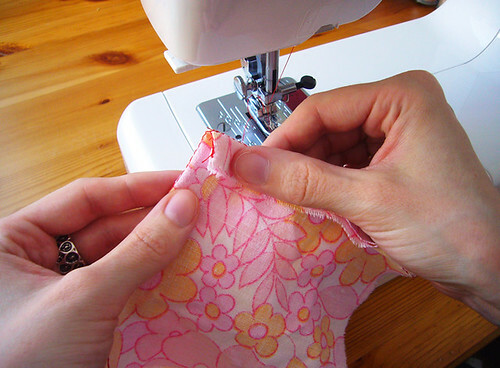 Sew the other edge of your project, making sure the seam allowance of your previous edge is sewn down too. 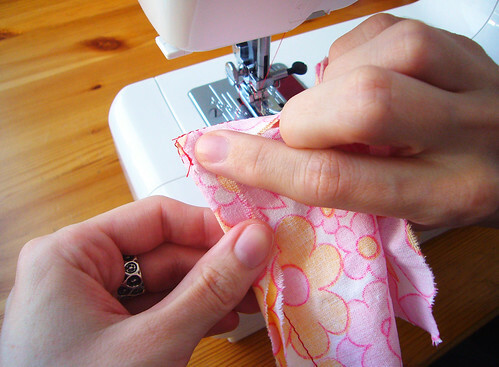 Fold the seam allowance down like you did before. I find it's good to hold the seam allowances in place when turning your piece, so that they'll stay nicely stacked and won't get all rumpled in the process. It does help to have small fingers that don't get in the way when working with smaller pieces. Ta-dah! You've made a really nice corner! I also made a video of this process, you can view it here: video! The best thing about making corners like this is that they're strong and durable because there's no need to clip the seam allowances, and the very tip of the corner is always nice and sharp. 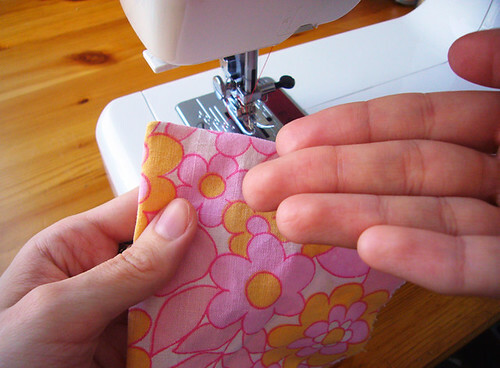 So, go forth and conquer those corners and spread the love of sewing everyone! I sent the rest of the money to Japan Earthquake Animal Rescue and Support (they have a website now: http://jears.org/) this morning, as the e-checks I was waiting for cleared during the night. Thank you once again to all who participated in the raffle and gave so generously. 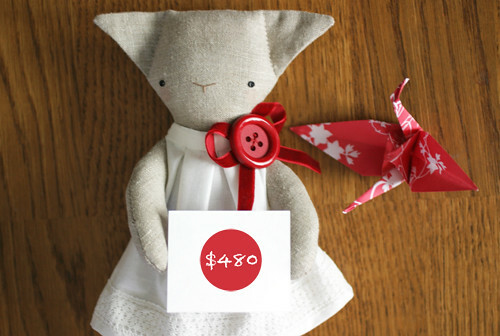 I am still amazed by how much money we raised, and knowing that the dolly and crafty communities are continuing to raise dizzying, amazing amounts for Japan is really heartening. "Bidding on works in "Handmade for Japan" is a fitting way to support the immediate rescue and recovery effort in Japan, and it is also way to give thanks to Japan for the way their aesthetics have helped all of us see the world around us in a different way. It is hard to ignore the parallels: the country that is beloved for its deeply considered, thoughtful craft and design is also a place where people seem to think nothing of putting others before themselves in a desperate situation. In a culture where the smallest detail is deserving of attention, no one is left behind." Like I've mentioned in previous posts, I owe a lot of my inspiration to Japan, and being able to give back in their time of need means a lot me. So once again, thank you to all of you who have donated to aid Japan, and thank you to all who are going to do so. You are wonderful people! You lot are really and truly amazing and the most caring, generous bunch of people ever! All together we've raised an incredible $480 for Japan Earthquake Animal Rescue and Support! Animals tend to be forgotten in the midst of all the chaos a catastrophe brings, so it's truly heartening to see so many of you willing to help out all the four legged (or two legged, or with no legs at all!) critters that can't help themselves, and as a result, their humans as well. 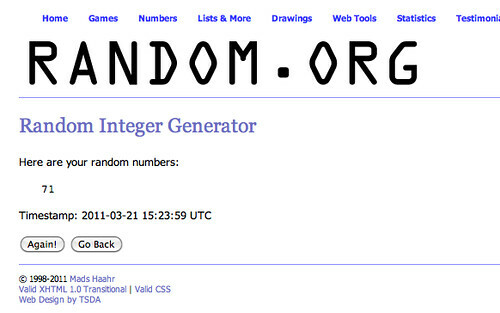 And the winner is ticket number 71, Cathryn Craig! Yay! P.S. : I am making the donation to JEARS in two parts, as I'm still waiting for a few e-checks to clear. I sent $460 to JEARS today with a note to say that it was raised by 40 wonderfully generous individuals, and I'll be sending the rest as it becomes available to my account. 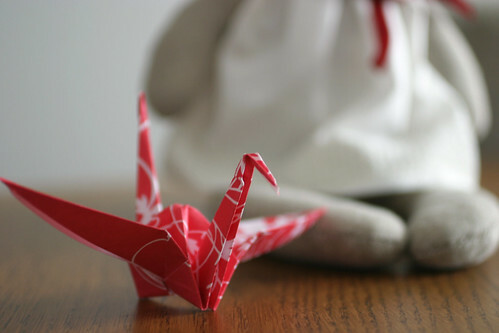 The earthquake and following tsunami in Japan have shook my heart too. Many of my friends and acquaintances in Japan were effected by the disaster, and they are still reeling from it and trying to cope with the aftermath. 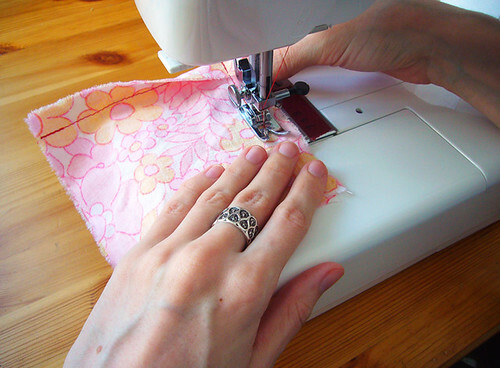 I have never been to Japan (I wish to go there one day though), but I still have an affinity for the place where my hobby (Chadô, The Art of Tea), most of my sewing tools and a lot of my fabrics come from. Japan is where my style, both of my work and of the way I dress, and plenty of my inspiration originates from. To me, it is the home of all things cute and amazing, and it breaks my heart to see the destruction and utter devastation of the catastrophe. I've even stopped following the news a few times when it all just go a bit too much for me. I've been especially hard hit by all the news about lost and forlorn pets, and even though there's been some good news too -that the residents, both human and feline, of Tashirojima, Cat Island, have survived the tsunami that almost swept the island off the map and the story of the lady who upon returning to her ruined home finds her pet cat has survived against all odds- I know that there are still loads of animals (and their humans too) in need. I don't have a lot of money to give, but what I do have an abundance of is time and skill. 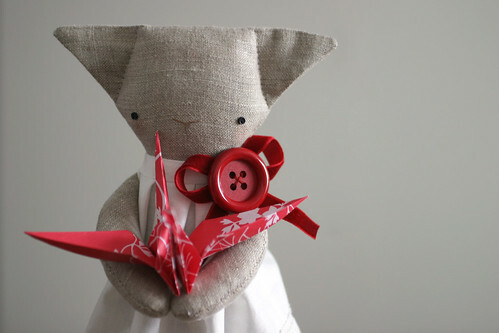 So, I am raffling off Kibou (希望, it means "hope" in Japanese) the little rag-cat to raise money for the Japan Earthquake Animal Rescue and Support. All the proceeds from this raffle will go to Japan Earthquake Animal Rescue and Support, and shipping costs will come out of my own purse. Kibou is a perfectly pocket-sized rag-cat (she's about 32 cm tall) and she's made out of soft linen and stuffed with rags and polyfill. She has little button eyes, an embroidered nose, a linen coloured button for a belly button and pretty blushy cheeks. 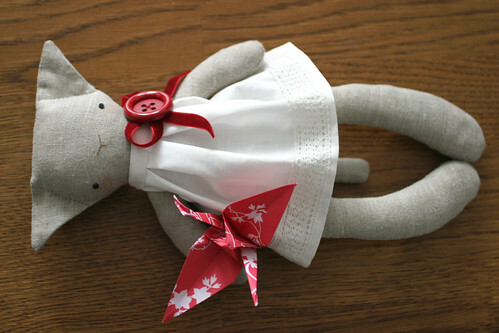 Kibou's dress is made out of white cotton and it has lace at the hem and a big red button with a velvet ribbon bow at the neck. The dress closes at the shoulder with a snap. Raffle tickets are $5 each and you can buy as many as you like. As this is for charity, I'm not limiting the number of tickets, and you'll have until next Monday, the 21st of March, to take part in the raffle. I will pick a winner when the raffle closes on Monday with the aid of random.org. You can pay for your ticket(s) through PayPal, and my PayPal-address is: *address removed, as the raffle has now ended* (please don't use the word "raffle" anywhere in your payment, simply write "Japan" as the subject instead). Please also consider donating to Japan's rescue and relief effort through the Red Cross of your country. And hug your family, friends and pets. Edited on Monday the 21st: The raffle is now closed and I'll be posting the results and winner soon. Thank you ever so much everyone! 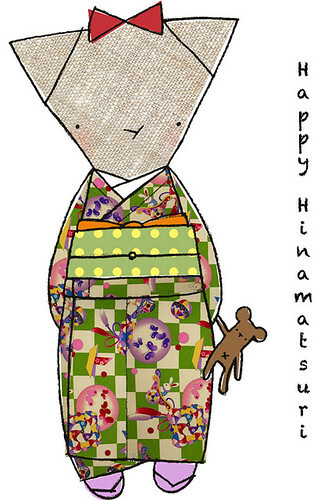 It's Hinamatsuri, Japanese Doll Festival, or Girls' Day today. Of course, Hinamatsuri isn't celebrated here in Finland, but as I am a girl and also very fond of dolls, it's a holiday I like to observe none the less. I'm spending the day dressing my dolls and hanging out with the Rag Pets and the best girl in the world, my cat BooBoo. I'm going to the tearoom for a Hinamatsuri tea gathering on Saturday, and I'm really looking forward to it. A friend and me will be making sweets for the gathering tomorrow, and I'll be serving as the hantô, the teishu's (host, tea maker) assistant at the gathering. It's promised to be a warm, or a whole lot warmer than it's been in ages at least, spring-y day on Saturday, perfect weather for celebrating all things girly and... umh, dolly.